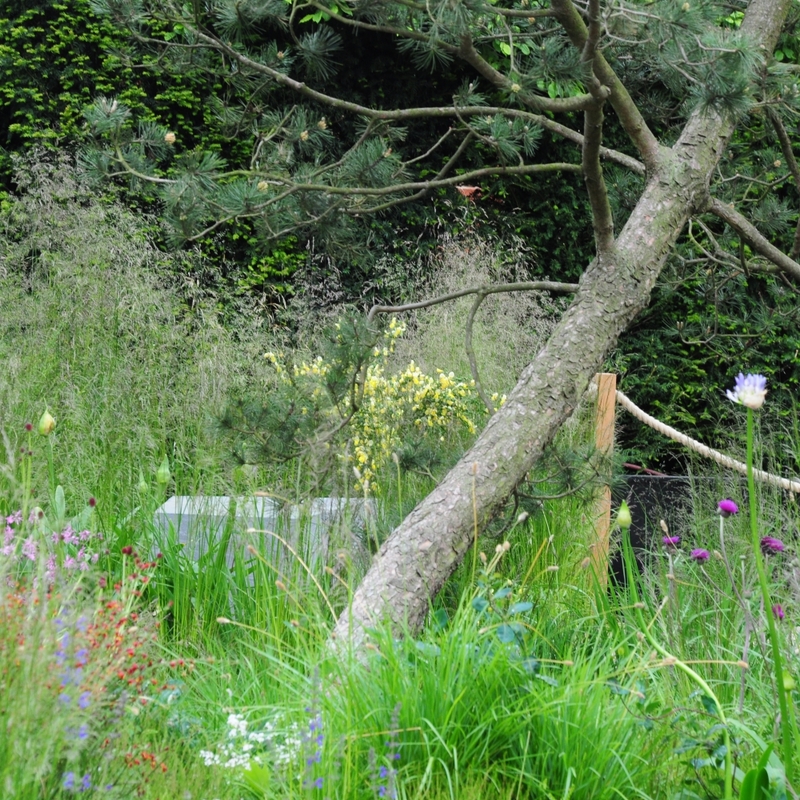 t started last year with Dan Pearson's "barely there" garden based on a real trout stream and has continued at Chelsea 2016 with a slew of other show gardens drawn from nature. Cleve West's evocation of his childhood on Exmoor is a natural extension of the idea of bringing the wild into the garden. Although Dan Pearson's garden was literally drawn from Chatsworth, Cleve West's garden is slightly less literal. The fabulously atmospheric and architectural trees are Quercus pubescens or Downy Oaks, natives of southern Europe rather than the south-west of England. The stone, however, is from the Forest of Dean, not so very far from Exmoor. The garden moves from a wilder feel with rough stone paths and native plants on the outskirts to a more designed feel with sawn stone and more exotic species in the centre of the garden. James Basson has drawn on the landscape of his home in the south of France as the inspiration for his show garden. It is designed as a wild garden on the edge of a lavender field with plants typical of the garrigue of haut provence. Some of the visitors to Chelsea found it hard to understand as a garden, thinking it scruffy and unfinished. The judges thought differently though and apparently it was a close runner-up as best in show. Other gardens, such as Hugo Bugg's garden based on the geography and flora of Jordan, have been slightly less literal in their interpretation of the idea of wild. His main aim was to draw attention to the scarcity and sanctity of clean water, the wildish landscape is the carrier of the idea rather than being the idea of wild itself. Rosy Hardy's first show garden was based on the fragility of our chalk streams. I got the bit about dried up stream beds but not the bit about printing money. What are all those metal things? This garden seemed quite a long way from wild, despite its message. And the complete antithesis to all this wildness? Jo Thompson's Chelsea Barracks garden featured, of all things, a large and neatly manicured lawn. Described as a rose garden for the modern day, it didn't even have a whiff of the crematorium about it. It is a very calm, elegant and spacious garden - proof that a garden doesn't have to be wild for you to feel at one with the world.